Firdausi, Abu’l-Qasem. 2018. Schahname. 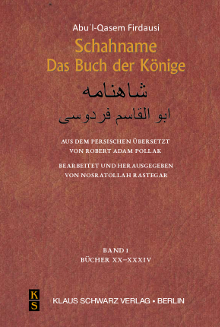 Das Buch der Könige. 4 vols. (Ed.) Nosratollah Rastegar. (Trans.) Robert Adam Pollak. With an instroduction by Florian Schwarz. 4 vols. Berlin: Klaus Schwarz Verlag. van den Berg, Gabrielle (ed.). 2017. Shahnama Studies III: The Reception of the Shahnama. Leiden: Brill. Cristoforetti, Simone (ed.). 2017. Shahnameh Il Libro dei Re. Testo Poetico Persiano Dell’edizione Turner Macan. Italo Pizzi. The first integral reprint of the Persian text of Abu ‘l-Qasem Ferdowsi’s Shahnameh printed in Calcutta (1829), published along its Italian poetic translation by the reknown iranologist Italo Pizzi (Turin, 1886-1888). 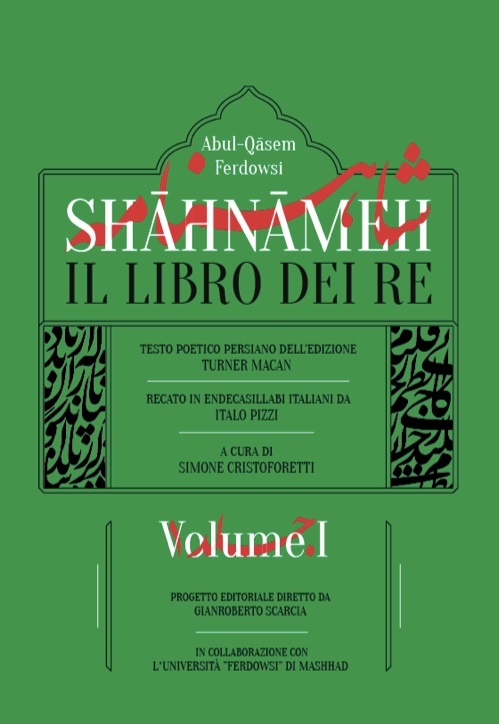 The Italinan translation is annotated by S. Cristoforetti (University of Venice) with reference to the critic edition of the Shahname by Dj. Khaleghi Motlagh. The editorial project is under the supervision of Prof. G. Scarcia (University of Venice) and undertaken in collaboration with the Ferdowsi University of Mashhad. Askari, Nasrin. 2016. The Medieval Reception of the Shāhnāma as a Mirror for Princes (Studies in Persian Cultural History 9) Leiden; Boston: Brill. Nasrin Askari explores the medieval reception of Firdausī’s Shāhnāma, or Book of Kings (completed in 1010 CE) as a mirror for princes. Through her examination of a wide range of medieval sources, Askari demonstrates that Firdausī’s oeuvre was primarily understood as a book of wisdom and advice for kings and courtly elites. In order to illustrate the ways in which the Shāhnāma functions as a mirror for princes, Askari analyses the account about Ardashīr, the founder of the Sasanian dynasty, as an ideal king in the Shāhnāma. Within this context, she explains why the idea of the union of kingship and religion, a major topic in almost all medieval Persian mirrors for princes, has often been attributed to Ardashīr. Nasrin Askari, PhD, (2012), University of Toronto, has completed a Postdoctoral Fellowship at the University of British Columbia, and will be working on her next project at the University of Oxford as a Bahari Visiting Scholar in the Persian Arts of the Book. Ghazanfari, Kolsoum. 2015. Ferdowsi’s Presentation of Zoroastrianism in an Islamic Light, Journal of Persianate Studies 8 (1). 23 – 41. Composed in 10th and 11th century ce, the Shāhnāmeh (The Book of the Kings) contains Iranian ancient history since the first king, Gayumart/Kayumars, up to the end of Sasanian era. One reason behind its popularity is the poet’s method and art in describing and explaining ancient religious elements in such a way that it does not cause religious bias among Zoroastrians and Muslims. This article shows that Ferdowsi has employed various methods to read religious issues of ancient Iran in the light of the social, cultural, and religious spirit of his own time. In his epic narratives, Ferdowsi paid serious attention to contemporary beliefs and social conditions, and this can account for the popularity of the Shāhnāmeh and its lasting influence. Mahalati, Mohammad Jafar Amir. 2015. Ethics of War and Peace in the Shahnameh of Ferdowsi, Iranian Studies. 48(6), 905-931. This article provides an overview of the ethics of war and peace in the most important and normatively influential work of epic literature known in the eastern lands of Islam, namely the shahnameh of Ferdowsi (d. 1020 CE). As one of the greatest sources of the Iranian cultural identity for over a millennium, Shahnameh (lit. 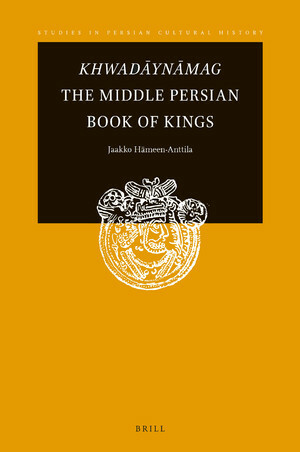 The book of kings) defines normative ideals in the ethics of war and peace within narratives that connect the ancient history of Iran to its mythical eras and in effect to both the medieval time of the epic’s authorship and modern Iranian identity. By identifying limits, standards and legitimacy for war and peace in Shahnameh, this article aims to facilitate an Iranian contribution to the global literature and practice on peacemaking that has deep roots in the Islamo-Persian tradition.